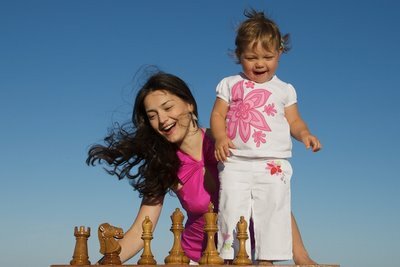 Let's all unite to wish all Women Chess Players who are also Mothers a wonderful Mother's Day! Maybe more than anybody we know how hard it is to balance our private and professional lives at the same time, and when our babies come into this world, travel, chess tournaments, and study become harder than before. Congratulations to all of you who have managed and continue to manage your motherhood and chess professional lives, it's incredibly hard to do, but you're doing it! I wish to all Chess Playing Mothers many moments of happiness in their lives. May our children be healthy and happy and may all our wishes come true, on the chess board as well as outside of it! There is a lot of joy coming through the smile in your photograph, may you have many more such moments with your little ones. Also I'd like to express my thanks to you and all Chess Playing Mothers who give so selflessly back to the game we all love. Ohhh... Your daughter is so beautiful!, she has a great smile... well, Happy Chess Mother's Day to you!